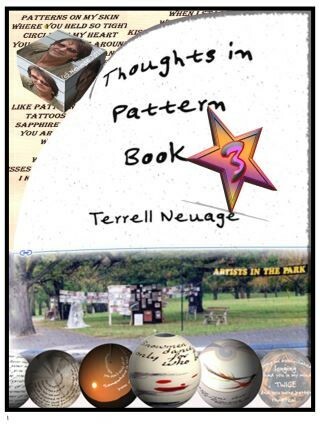 Thoughts in Patterns is a collection of books of textual imagery. I have been creating picture poems for more than fifty-years, starting with being a street-artist in New York City in the 1960s then New Orleans in the early 1970s. My work from the late 1960s to mid-1970s was primarily paintings with text embedded. Beginning mid-1970s and through the late 1990s I used photographs. For the past twenty-years my work has been a combination of paintings and photographs as well as other media along with a growing use of digital media. My photographs are from my travels and more recently from studio work using blue-screen and objects. Terrell Neuage, tourist. I am originally from upstate New York which I left in 1965 age 17 to see if there was anything more to this world than a quiet farming life. I did not get back to where I started until 2002 when both my hometown and I had changed a bit. I was an explorer of the 1960’s Californian hippy life style, a street artist in New Orleans in the early 1970s a ‘brother’ in a cult order for about a decade, and then single parent for twenty years in a foreign country, Australia. Through all this, I had one linking theme in my life which was a fascination of the art of combining imagery with text. Whether using painting, photography or multimedia I have been experimenting with textual-imagery-narratives for more than fifty-years. My education has been from leaving school in tenth grade combined with street-learning to parenting to formal education starting when I was in my mid-40s when I did 14 years straight of university from a BA to Masters to PhD with a teaching degree added for good measure in my 60s. Since 2002 I have taught technology, film, and multimedia in the States, China, and Australia to every grade from kindergarten through to university. I currently live in Adelaide, South Australia with my wife and ‘Turtle’ our caravan, who takes us on short and long trips. I’ve still been known to make an occasional appearance in the public schools of my city, but when not working or traveling Australia, we are planning trips somewhere in the world where I will continue to gather material for my picture poems.